It's spring break. Unless you're one of the lucky ones who've managed to sneak away to sun or snow, you're probably like us. Trying to keep the kids busy to avoid hearing those two terribly guilt-inducing words 'I'm bored'. If you've already given games a go (Bug Balance is a favourite), survived the inclement weather with your Nature Bag (gets them outside and away from the TV, as shown) and have already put together all the activity kits in the house (have you tried the Green Science Robobug from a pop can?) - then perhaps you'd like to try this. It's a simple craft with minimal tidy up. And it's timely - a way to celebrate St. Patrick's Day since the kids won't be doing it at school this year. Our girls really enjoyed it. Hope your kids do too! Cut shamrock shapes out of sandpaper. 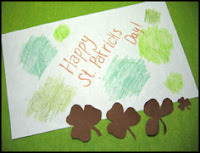 Use different grains of sandpaper and cut the shamrocks in several different sizes. Tape the shamrocks to a table. Show your child how to place his paper over the shamrock and rub with the side of a crayon to get a Saint Patrick's Day design. Visit Lavish & Lime for toys, activity kits and other ideas for kids to enjoy. Global Warming: where are you?